Back row: Ann Marie McKeon, road safety officer with Longford County Council; Cllr PJ Reilly, chairperson of Longford County Council; Garda Superintendent James Delaney; Colm Smith, Road Safety Officer with Westmeath County Council. Front: Garda Breda Smyth, Joyce Baltazar, Rebecca Goddard, Vaari Hourigan, Alisha Collins (sub), and Catherine Hannon, teacher. The Junior School Warden Scheme has been operating in Ireland since 1969 and currently operates in one school in the locality - St Peter’s, Athlone. 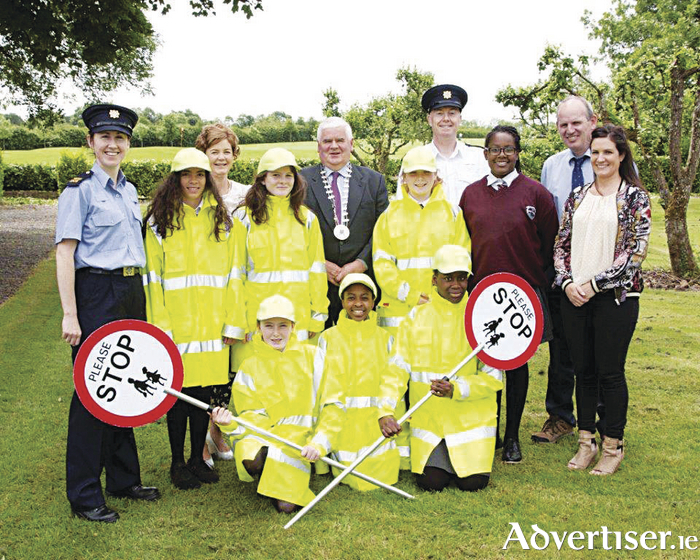 Road Safety Officer for Westmeath County Council, Colm Smith, acknowledges the work done by the Junior School Wardens during the year. “Each of these pupils is doing a superb job in ensuring that their fellow students are kept safe crossing our roads before and after school each day. They are also providing an excellent example to their fellow students and help raise road safety awareness. A regional competition, sponsored by the local authorities and the Road Safety Authority, is held each year with teams from each school participating. This year the competition was held on June 14 in Newtownforbes, County Longford, with four teams representing Westmeath - St Etchen’s, Kinnegad; St Peter’s, Athlone; Coralstown NS; and St Ernan’s, Delvin. Teams were of a very high standard, with first place in the competition awarded to Newtownforbes NS and St Etchen’s, Kinnegad finishing runners-up. Prizes were presented to the winning teams with a plaque issued to all teams competing on the day.